We provide comfortable, beautifully furnished accommodation for two people (perhaps accompanied by a baby or small child) in an idyllic setting in North Dorset, UK, within easy reach of the Jurassic Coast and many other places of interest in Dorset, Somerset and Wiltshire. These include the old market town of Sherborne (formerly the capital of Wessex), with its abbey and two castles, Athelhampton House near Dorchester, Stourhead Gardens, Longleat House and Safari Park, Montacute House, and the picturesque towns of Wells, Glastonbury and Bath, not forgetting, of course, West Bay near Bridport, home of the TV program Broadchurch. We are close to a number of SSSIs, and our garden is visited by a variety of wildlife. Alner's Gorse, a local butterfly sanctuary is a short walk down a green lane. We also maintain a small flock of sheep and in the spring there may be lambs in our paddocks. The accommodation we offer is located in an annexe that adjoins the main house. It has recently been refurbished throughout. Guests are welcome to bring a dog, as long it is well behaved (we have our own dog, cats and sheep). 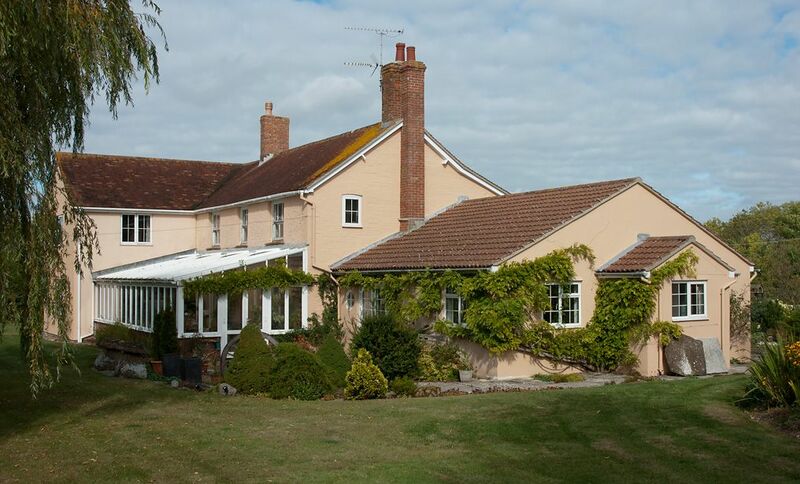 Ridge Farm Annexe is often described by our guests as being 'like a home'. And that's exactly what it was for 25 years when Madeline's mother lived here. The Annexe was completely refurbished during 2014, with brand new bathroom fittings, new carpets and a redesigned kitchen. The accommodation consists of a sitting room, bedroom, kitchen, bathroom and hall. The sitting room is equipped with a comfortable sofa and armchairs, and there is access to the patio outside through sliding French doors. A TV is provided, as is wireless broadband, and there is also a selection of games and jigsaw puzzles -- and two bookcases full of books in the hall. The bedroom is furnished with two comfortable 3' beds with pocket-sprung mattresses and duvets, 2 chairs, 2 bedside cabinets, each with a bedside light, a small chest of drawers, and a built in wardrobe with shelving. A cot for a baby or camp bed for a child can be provided. The recently completely refurbished bathroom is equipped with a corner bath, walk-in shower, basin and toilet. There is a mirrored cabinet over the basin and a shaver point suitable for both 240v and 115v appliances. The kitchen is fully equipped with a ceramic-topped, two-oven electric cooker, a microwave cooker, a fridge with a small freezer compartment and a washing machine (3kg wash). In the winter there is also a condenser tumble drier in the porch. Crockery and cutlery are supplied, together with cooking utensils and all other normal kitchen equipment. For dining there is a table and chairs. Towels and linen are provided. Meals are not provided, but a supply of basic provisions, including bread, butter, milk, coffee, tea, sugar, flour, salt and pepper, will await you on your arrival. If you would like us to, we can also supply additional provisions at cost (payment on arrival). Please order these at least 48 hours beforehand. Access to the Annexe is via a private porch and you will be free to come and go as you wish. You will also be very welcome to make use of the patio and the rest of the garden. Madeline and Mark have lived at Ridge Farm for 38 years. Madeline trained as a cook and is a keen upholsterer. Mark is a former writer turned photographer, designer and IT consultant. He has worked from home for the past 45 years. We bought Ridge Farm in 1980 almost entirely because of its peaceful location some distance from the nearest road. At the time the house was in a fairly dilapidated state, but over the years we have carried out repairs and made improvements and now we have no intention of ever moving out if we can possibly help it. Coffee (instant), tea, sugar, marmalade and condiments are provided. We also supply a loaf of bread and 2 pints milk of your choice at the start of your stay. We have had a really lovely weekend stay at Ridge farm annexe. Friendly owners who so kindly provided bread, milk etc on arrival The annexe is spotlessly clean and the bed sheets smelt heavenly! Beautiful views across the countryside from the annexe and I could've stood all day by the kitchen window watching all the different birds on the feeder. A great base from which to explore Dorset. A wonderful stay, Many, many thanks. Homely base to visit Dorset villages. Nice quiet place to rest after a long day out.Very clean and every thing you need for your stay. We stayed only two nights and we wished we stayed longer, Madeline and Mark were very nice and friendly and the property was clean and comfortable. We highly recommend this place, it was very quiet and peaceful, the perfect break that we needed. Lovely cottage and very friendly and welcoming hosts! An ideal location for a peaceful, country getaway. Compact layout, comprehensive kitchen and comfy beds. Would have appreciated more comfy seating.